Medical and health science education facilities are increasingly using newer technology to enhance their teaching and learning modalities for their students and faculty. AIUWA's Telemedicine Center is located at Serekunda Hospital facilitated by the African Union/ The Government of The Gambia through Ministry of Health and Social Welfare, & the Government of India (Ministry of External Affairs) executed by Telecommunication consultants India Limited through PAN AFRICAN e NETWORK PROJECT. Telemedicine program is available to all students who register on time. The lectures are provided by qualified and experience doctors from reputed institutions. Telemedicine program is made available to students in advance each month. Students are encouraged to participate in their choice of topics which are made available in advance, each month. 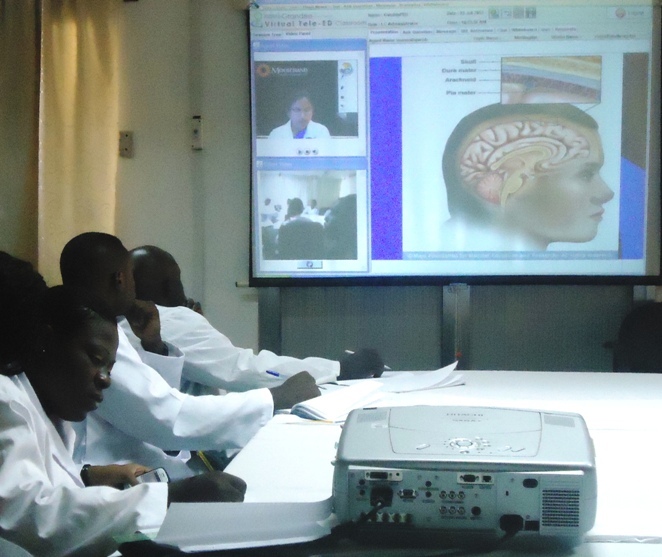 Located on first floor next to the administration building at Serrekunda Hospital, Kanifing, the lectures are provided live with two way video and audio conferencing. Tests of "Fetal well Being"
ALL ATTENDING STUDENTS MUST ARRIVE AT SERREKUNDA HOSPITAL, ADMINISTATION BUILDING 30 MINUTES PRIOR TO THE START OF LECTURES POSTED TIME. NO STUDENT SHALL BE ADMITTED INTO THE TELEMEDICINE ROOM 15 MINUTES PRIOR TO THE START OF LECTURE. ALL STUDENTS MUST WEAR THEIR WHITE COATS WHILE ATTENDING THE TELEMEDICINE CLASSES. ONLY REGISTERED STUDENTS CAN ATTEND THE TELEMEDICINE CLASSES.